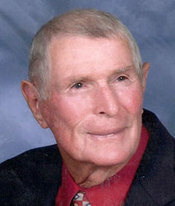 Roy Edgar Henderson, 84 of 5454 NC Hwy. 86 South, Yanceyville, NC went to be with his Lord on Friday, October 31, 2014 at the Hospice Home in Burlington, NC. Roy was born on June 7, 1930 to the late Rawley E. Henderson and Annie Dawson Henderson in Ringgold, VA. Survivors include two daughters Jewel Hamlett (Neal) of Roxboro, NC and Denise Tatum (Keith) of Yanceyville, NC; grandchildren Cody Tatum, Mark Hamlett (Ashley), Dana Hamlett Parrish (Adam), Jessica Gibson (Logan) and Eric Landreth. He is also survived by numerous nieces and nephews. In addition to his parents he was preceded in death by his wife Madeline Carver Henderson in March 2014 and by his daughter Deborah Landreth, sisters Cordia Jennings, Margaret Turner, Virginia Powell and Beulah Lewis; brothers, Chesley (Bill) Henderson, George Henderson and Ellis Henderson. Roy loved working in the yard, tinkering in his shop and antique cars, in which he owned numerous over the years. Most importantly he loved his girls and his grandchildren. Roy served in the US Army during the Korean War. After 30 years of service he retired from the NC Department of Corrections as a Sergeant. In June 2010 he received the prestigious Order of the Long Leaf Pine award. He was also a member of the American Legion Post 447 where he served as Chaplain. Roy was a faithful member of Bethel United Methodist Church in Prospect Hill, NC. He also volunteered at the Senior Citizen Center in Yanceyville, NC. Funeral services will be conducted by Reverend Bob Way and Reverend Joe Jackson on Monday, November 3, 2014 at 2:00 p.m. at Harrelson Funeral Home in Yanceyville, NC. Visitation will be held on Sunday, November 2, 2014 from 6:00 p.m. to 8:00 p.m. at the funeral home. The family will receive family and friends at 5454 NC Hwy 86 South, Yanceyville, NC. Interment will be conducted after the service at Cooper Cemetery, Prospect Hill, NC. Pallbearers will be Edward Jennings, Jerry Powell, George Henderson, Jr., Donald Carver, Sr., Thomas Carver, Jim Powell, V. Mac Baldwin and Steve Penny. Memorials may be made to the Cooper Cemetery Fund, c/o Edwin Yarbrough, 1223 Ridgeville Road, Prospect Hill, NC 27314 or to Hospice & Palliative Care Center of Alamance-Caswell, 914 Chapel Hill Road, Burlington, NC 27215. Uncle Roy was loved by all his nieces and nephews. He is now with Aunt Madeline in heaven. Jewel and Denise you both are in our thoughts and prayers. We love you. Roy was a dear sweet man who will be missed by his family and friends. My heart understands just how you are feeling.But they will never be to far away from your memories you will hold next to your heart.My prayer is that God will lighten your heavy hearts and let you remember all the good times you have shared.This is a very hard thing to go through .Im thinking of you all at this time. Your Dad was a sweet man and everyone loved him. I'm so sorry for your loss and I will keep you all in my prayers. Love you!! Sunset and evening star; and one clear call for me! And may there be no moaning of the bar, When I put out to sea..